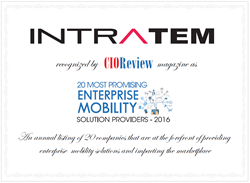 CIOReview named Intratem among the 20 Most Promising Enterprise Mobility Solution Providers of 2016. A distinguished panel comprising of CEOs, CIOs, VCs, analysts, and CIOReview’s editorial board has selected the top players from over three hundred mobility management companies naming Intratem among the elite group. We’re always proud to be a part of our clients’ success and will continue to pursue the highest standards of service for our customers. Intratem, a performance based Mobility as a Service (MaaS) provider which includes Managed Mobility Services (MMS) and Wireless Expense Management (WEM), today announced that it was named on the list of ‘20 Most Promising Enterprise Mobility Solution Providers 2016’, which is developed by CIOReview. CIOReview selected Intratem in recognition of the company’s specialties in wireless expense management/optimization/audit, wireless device management, end-user support, wireless expense reporting, and its contingency-based business model, which guarantees performance.